Peter Brady has been featured himself on Runner's World. His masters mile savvy shows in his podcast. Peter’s Masters Milers project starts with John Trautmann and Nick Berra. He asks great questions and garners amazing details of their lives. 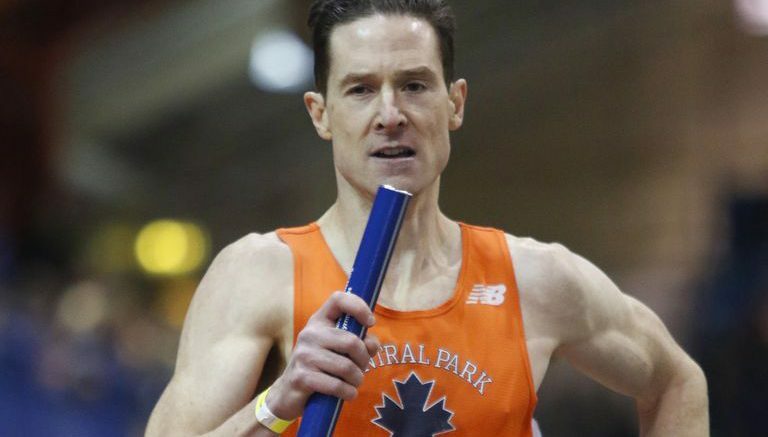 (Nick saw himself in high school as a football player who ran track — mainly 400/800 in sub-48 and 1:53 — and was a Naval Academy badminton champion — who didn’t run his first masters mile until past 40 at Hartshorne). John talks about how fellow record-setter Brad Barton was an inspiration for him as they both chased the M45 record. His next interview is with Sonja Friend-Uhl. Masterstrack.com: Tell me about your track history. Peter Brady: I ran track in high school and college (at Columbia University, where I graduated in 1993). During college I was an 800m specialist, but I wasn’t a great runner in college – my PR was 1:53. I continued to stay fit and occasionally run road races after college, and then in my early 40s decided to try competing in middle distance events on the track as a master. I had way more success as a masters runner than I ever did in HS or college. From 2013-2017, I won five consecutive USATF outdoor national championships in the outdoor 800m (40-44 age group from 2013-2016 and 45-49 age group in 2017). I also won the Hartshorne mile once and won the masters mile at the New Balance Indoor games twice in 2016 & 2017. More recently I won the 1500 and 3000 at the 2018 Indoor National USATF Masters meet. A few years ago, Runners World did a short article for their website on me, which has more info. Unfortunately, I’m dealing with a case of plantar fasciitis right now, so I don’t have any short term running goals, but I’m hoping to be healthy and competing well again for outdoor track. In terms of the podcast, I plan to do at least one interview per month, but hopefully two. And the overall goal is to create a podcast that masters runners of all ages, gender and ability level will find entertaining and informative. Given that my primary focus is middle distance events, my first bunch of guests will likely be middle distance runners, but over time, I would be happy to broaden the focus to include longer distance runners or even sprinters. Peter set up an email account specifically for the podcast: peterbrady@mastersmilers.com. Feel free to write him and suggest other folks to interview. Mazel tov and best of luck to Peter and his milers! Be the first to comment on "Peter Brady debuts Masters Milers podcast on iTunes with John Trautmann, Nick Berra"